This Friday’s letter is V for Virtual Visitor. I have visited about 200 new blogs since I started the A-Z challenge. My goal is continue to sample the work of as many of the participants as I can, long after I write my last post. So far, I am struck by the wide variety of topics and writing styles. My strategy for selecting which blogs to initially read was to choose blogs in the categories MI (miscellaneous) and PR (personal). Those are the type of posts I am most interested in. As I was going through the list, I found that I was also attracted by catchy titles. My decision to follow a new blogger and become a long term visitor is based on how much of the author’s personality shows through his or her posts. I imagine what it would be like to have a real conversation with the writer. I wonder if we would be friends in the real world? If the blogger engages me with humor and wit, manages to tug at my heart strings, piques my curiosity, or expands my horizons a little more, then I will surely add their blog to my reading list. As I said I am still in the process of visiting new blogs and I must say I am enjoying it as much as writing my own posts. Have you been a virtual visitor during this challenge? What makes you want to return to a blog? 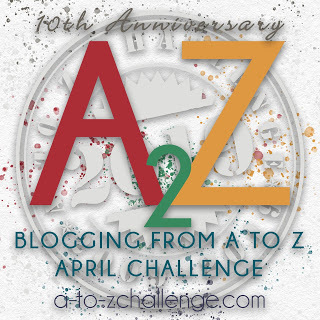 Why not check out other postings written by the more than 2,000 bloggers participating in the 2014 A-Z April Challenge. I too like catchy titles when checking out blogs. I have visited blogs during the challenge; not so many the second half, but tried to shoot for 10-15 new blogs in the first part.I tend to stay away from blogs that feature a lot of decorating since I don't decorate, LOL. I like reading about "real life" so that's what might draw me back to a blog. I also like to develop friendships/relationships with fellow bloggers so if I visit blogs and leave comments and never get feedback or a return visit, then I'm less likely to return to their blog, make sense? I too am not interested in decorating or food blogs. I understand what you mean about establishing relationships. But, just like real life, people have come in and out of my virtual life. I have visited quite a few, but not 200! Wow you've been busy! I'm glad we crossed paths. I have enjoyed your posts. I didn't have any method to how I chose which blogs to visit. I have found some good ones and added quite a few to my reading list. I’m glad you and I have found each other’s blogs. You are a good writer and story teller. I enjoy reading your posts. I've tried to do five a day. I've just picked randomly from the list. I've run into a lot of sci-fi and movie reviews...neither of which interests me. I, too, like the personal stories. I like to get to know the writer, but if they never visit me or interact with me, I'm not likely to continue to visit. You and I are in sync with the sci-fii and movie reviews. I’m not a fan of either. I often visit my regular, favorite blogs but sometimes I am shy about leaving a comment. I see now, that is an important part of establishing and maintaing these virtual relationships. I'm not in the challenge, but I did look at the list. I find good blogs through comments. Sometimes the comments are better than the blogs. loved your take on Virtual Visitor. My likes are quite different than what you identified but like you I stay engaged if my interest is caught. I love good writing, like yours. Hope to read more. Good luck with the A-Z! Thank you for visiting and for your nice comments. I’ll be visiting you. I've been going through the list starting at the blog following mine, but I don't comment on them all. I guess the post has to speak to me in some way. And not put me off (some seem to). I'll develop relationships with bloggers who comment back, unless the blogger is really speaking to me in some way (I've found two blogs that that's true for). I completely understand what you mean. Even though I have visited 200 blogs, I have not commented on all of them either. I have found a few new ones which is one of the benefits of the challenge.